That is one scary seal and one crazy photographer. I mean that in a good way. I predict that one day he will be eaten by something. Maybe the seal was trying to fatten him up. So close! We’re nearly there! Just a few more things to ban, then a few more things to mandate! We can do it! I guess we get the government we deserve when we elect people like Isadore Hall (sponsor of AB1576) and Alex Padilla (sponsor of SB 270). I mean when you elect them – I didn’t vote for either of them. So WE get the govenment YOU deserve. Thanks A**holes. Once again every sane Californian gets screwed because the butterfly chasers in a few assembly or senate districts elect numbskulls like these two. But then the rest of the idiots..I mean Democrats go along. This is what one party rule looks like. Oh…In My Opinion. Our only hope now is for Jerry Brown to be the adult in the room and veto this nonsense when (notice I didn’t say if) it passes. This is taken from the testimony of Tim McAfee, director of the Office on Smoking and Health at the U.S. Centers for Disease Control and Prevention at a Senate Hearing on Thursday May 15th, 2014. It seems that among some health experts there is a fear that the use of electronic cigarettes (or e-cigs, or “vaping”) will encourage teenagers to smoke actual cigarettes. All well and good – I suppose that’s why we have highly paid people working at places like The Office on Smoking and Health – to worry about things that hardly anyone else worries about. I mean, things have a right to be worried about don’t they? Hmmm…might have to think about that one. Because there are some things that deserve to be worried over that aren’t getting the attention they deserve; Specifically whether the liberaliztion and in some cases outright legalization of marijuana use might be encouraging teenagers to smoke – not cigarettes, but marijuana. As I have written before, I believe there are these two things taking place today, the “normalization” of marijuana use and the appearance of E-cigs as a smoking substitute and that they have obvious parrallels; and it is unfathomable to me that nowhere in the media or government do I see anyone connecting the dots. Cigarette smoking is considered a public health issue, and deservedly so, though I do take some issue as to where the line is being drawn between regulation/prohibition and one’s personal freedom to chose. You see, I’m pro-choice regarding cigarette smoking; I’m also pro-choice regarding marijuana smoking. What I do not understand is how all the worrying and hand-wringing about the ever so slight possible harm posed to children and teenagers by e-cigs does not in any way carry over into what I believe is the more likely potential harm caused to young people by increased marijuana use. I don’t think anyone is arguing that there is no risk to young people associated with relaxed marijuana regulation – I just don’t think anyone’s talking about it at all. To the extent there even is a debate, it is primarily whether legalization/increased use is better for adults or society as a whole. Meanwhile there is frequent discussion nationwide over the looming threat posed by e-cigs, a threat so dire they should be banned. Banned – instead of being hailed as a benefit to public health, which in my opinion they are. Banned – also in my opinion, because they “look like” smoking, and are percieived a successful “end-around” of smoking regs by smokers. And we can’t let the smokers win. Since these public health “debates” always end up being about the best way for do-gooders to bully adults around because their behavior might possibly wound a precious child, can we at least invite marijuana to the witch trial? I haven’t written lately about the diappearance of the Malaysian Airline Boeing 777 for awhile since there was really nothing new to report. As of my last post, the plane was presumed crashed in the Indian Ocean, with all passengers and crew lost even though not a trace of wreckage has been recovered. The presumtion of a crash and also the presumed crash location (vague as it may be) have been inferred by analysis of communication signals between the plane and a satellite done by the satelite’s owner, British telecommunications company Inmarsat. Authorites have based their search on the assumption that the plane was somewhere within a large area of the Indian Ocean where no possible landing could have occurred when the signals stopped and this assumption was based on the sattelite data analysis done by Inmarsat. Since no trace of the airliner has yet been discovered, outside experts are attempting to confirm Inmarst’s analysis – and they are finding inconsistencies which call into question the accuracy of the analysis that all investigative assumptions have been based on so far – mainly the assumtion that the plane took a southern flight path over the Indian Ocean instead of north toward Pakistan. 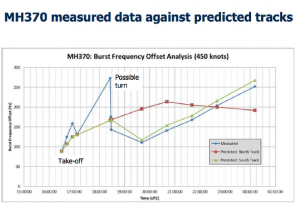 “This graph is the most important piece of evidence in the Inmarsat analysis. What it appears to show is the frequency shifts or “offsets”—the difference between the normal “pitch” of the plane’s voice (its radio frequency) and the one you actually hear. Problem is, it’s not so simple. There are a few aspect’s of the airliner’s flight path before radar contact was lost that are absolutely known, and some of the Inmarsat analysis does not line up with that data. Officials close to the investigation stand by the accuracy of their analysis, but will not release all relelvant data that outside experts would need to conclusively confirm it’s accuracy. When I wrote my first post on this I believe I said that when the truth about what really happened comes out (if ever), it would be stranger than fiction. So far that is the case. As they say, Stay Tuned. Apparently since I am over 50, I am a dinosaur as are most of my family and acquaintances. I know this is true because when I tell people I know to read my blog, they say “what’s a blog?” I am so screwed – since I don’t write about Beyonce or Justin Bieber no one under thirty will ever read this and no one over thirty knows what a blog is. So let me tell you a little bit about how I found out about blogs, became a reader of blogs and then went on to blogging. I have never thought of myself as an early adopter of technology but I have been using the internet since the early 1990’s. Thinking about it now, it was the dawn of time. My chosen portal: AOL, now just a footnote to history. I started out reading what they called “newsgroups” which were kind of like discussion boards where someone would post an article or website adress, people would read and discuss. 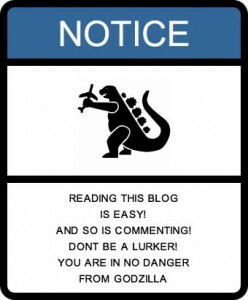 Usually I would “lurk” in these newsgroups, a term that means to look in, read the article and discussion but not participate – if you don’t speak up, no one knows you’re there. This evolved into general web surfing and a few sites helped fuel that, mainly The Drudge Report (which started out mainly as movie industry news and gossip) with it’s many links to news stories. Another was Lucianne.com founded by Jonah Goldberg’s mother, Lucianne Goldberg. It’s still around. Finally, sometime in the early 2000’s a Radio Talk Show host I listen to named Hugh Hewitt began talking about this new thing on the internet with a funny name. Blobs? No, that can’t be it. BLOG! That’s it – internet lingo shorthand for weblog. 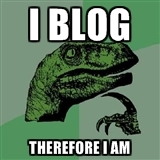 Weblog = weBLOG = BLOG. He wrote a book about it. Anyway, the amount of information and perspectives on information available to me online took a quantum leap with that revelation. There are blogs about everything you can think of. I zeroed in on politcal blogs mostly, but also branched out into Law, and Science as well as general interest. Many bloggers write about other subjects in addition to their area of expertise if they have one. When 9/11 happened, I started reading the military blogs or MILblogs. Yes, the blogosphere has covered the War on Terror. Over the course of years, I came to admire some of these bloggers (whom I have never met, nor communicated with) and at some point decided that imitation would be the best form of flattery. On the sidebar to the right you will see a heading that says “Some Blogs I Like”: Click on any of those, they are worth your time. The subtitle of Hewitt’s book sums up the what Blogging is to me and why I decided to become a participant instead of just an observer: “Why You Must Know How The Blogosphere Is Smashing The Old Media Monopoly And Giving Individuals Power In The Marketplace Of Ideas”. I have decided to exercise my power and transform my exploration of life into a creative exercise – and to invite you along. If you are lurking here, your journey has already begun. Step into the light, introduce yourself and we can all continue our journey together. I write about anything that happens to be of interest to me, and the subject matter is varied. The posts are in chronological order, the newest at the top – you can keep scrolling down to the bottom of the page and keep going back to view older posts, all the way back to the beginning of time…err.. when I started this blog in February of 2014. If you like what I write about some subjects but don’t care for others, look on the sidebar to the right. You will see “categories”. All my posts fit into one or more of these categories. Click on the category you are most interested in, and you will see only posts in that category. Simple. Within my posts I often link to additional information and/or another blog or article that inspired the post. When you see a word in red text, that is a link to additional information. Click on it and the link will open in a new tab. Any pictures within a post can usually be viewed in a larger version by simply clicking on the picture. Please comment! To the left of the title you will see a box with the date and below it a box that says comments. Click there and a dialogue box will open where you will be able to write comments on the article. This is how I know you’re reading and I welcome all feedback on my writing. You will be asked for your name and e-mail adress but don’t worry! You can use an alias if you don’t want to disclose your name and your e-mail adress will not be displayed, nor will I spam you. I moderate all the comments so I will see your comment. It is a happy ending, but the boy was bitten and required stitches – mom apparently was also bitten. It could have been much worse. That is one awesome cat!